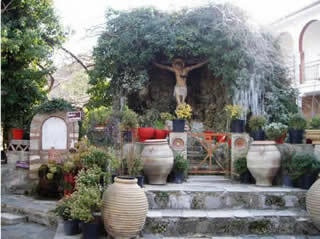 The Byzantine Museum of Fthiotida in Ypati operates since January 2007. 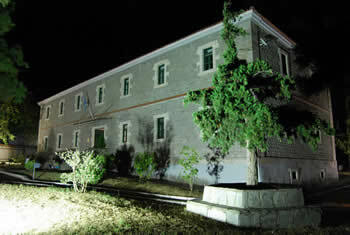 The museum is housed in the building of “Kapodistrian barracks”, erected in 1836 to meet the needs of the Greek Army. In the museum, which is extended in two floors, are presented representative discoveries, that are emanated from various regions of Fthiotida and are dated in the early Christian and Byzantine period (4th-14th century). On the ground floor, the exposition is devoted to early Christian mosaics of Fthiotida (4th-6th century) and has a strong educational aspect, while on the first floor the exposition is devoted to the worship in early Christian and Byzantine period. In the Hall of early Christian period the exhibits are mainly architectural marble and mosaics, emanating most from basilicas, while the ceramics that present (utilitarian utensils, oil lamps, textile weights etc. ), give elements about the daily life of the specific era. In the room of Byzantine period, dominat position is held by items of a Byzantine marble temple, found in ruins in Agnantis, Lokrida (12th-14th century). Also architectural sculptures are exposed from a non-preserved Byzantine church in Alepospita (12th century). Among the exhibits of the Byzantine Museum there are several coins from the wider area, from the Byzantine era. These monetary “treasures”, that come from excavations, traditions and meditations, give us useful knowledge about the currency in Fthiotida. Among the exhibits of the Byzantine Museum there are several coins from the wider area, from the Byzantine era. These monetary “treasures”, that come from excavations, traditions and meditations, give us useful knowledge about the currency in Fthiotida. In a specially designed area of the floor, a part of the monetary collection of Ypatian Constantinos Kotsilis is exposed. The collection was donated to the Greek State, in order to be exhibited at the Museum. The collection contains 3000 ancient Greek, Roman, Byzantine, medieval, modern and contemporary coins. Visitors have the opportunity to see representative samples of the collection, covering a large area in space and time. The Byzantine Museum of The Byzantine Museum of Fthiotida in Ypati gives the opportunity to the local citizens, but also to the visitors, to come into contact with the archaeological wealth of Fthiotida. 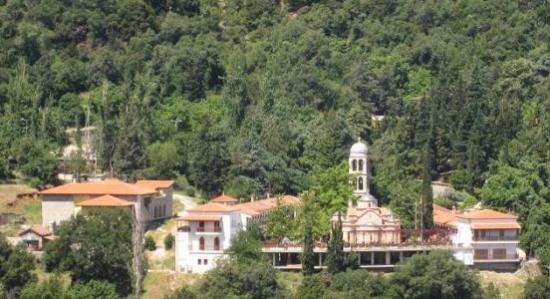 Holy Monastery of Agathonas In a magical environment, on the way to Lichnos and close enough to Ypati, there is the Holy Monastery of Agathonas, σat an altitude of 553 meters, at the slope of mountain Oiti. The Monastery was built in the 14th-15th century and it’is a typical example of Byzantine style. The tradition says that the old Monastery, in which Holy Agathonas was an ascetic and was built in the middle of the villages Lichnos and Kastania, suffered subsidence and the picture of Virgin Mary was disappearred. The picture was found in a cave full of light. Near this place, Holy Agathonas built in 14th – 15thαcentury the Monastery. Even today, residents of surrounding villages, especially those of Lichnos talk about the existence of a Monastery “in the old in the southwestern part of the village, in a place called “Paleomonastiro( Old Monastery)”. In the monastery, again according to tradition, he led his asceticism monk Agathon, sometime. In this Monastery, according to tradition, was Holy Agathonas an ascetic, but no one knows when. 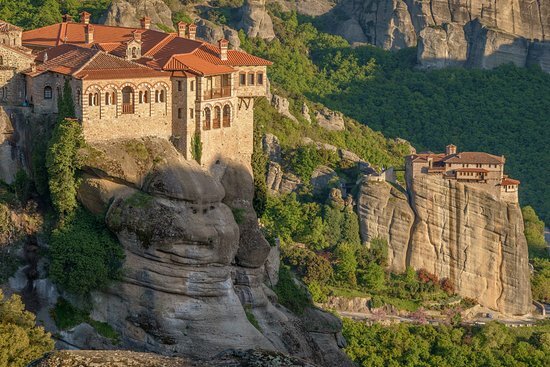 The monastery, after the death of Holy Agathonas, was named “The monastery of Agathon” by the monks. During the years the Monastery suffered from disasters, such as this at the year 1822, when Dramalis (Turkish pasha) burned the church. Many valuable artifacts and relics are saved inside the Monastery. Dozens of crosses, sacred vessels, tabernacles, holy relics, holy pictures, vestments, scripts, books were collected from temples and destroyed monasteries of the region by the Abbot Germanos Dimakos and in this way were saved from looters. Today, except from the worship to the Holy Monastery, the visitor can also admire the unique habitat of the peacocks, pheasants, partridges, ducks and various other bird species. He can also see deer, pheasants, partridges and wild sheep in a special area, approximately 1,200 acres, which is the breeding ground of the Monastery. 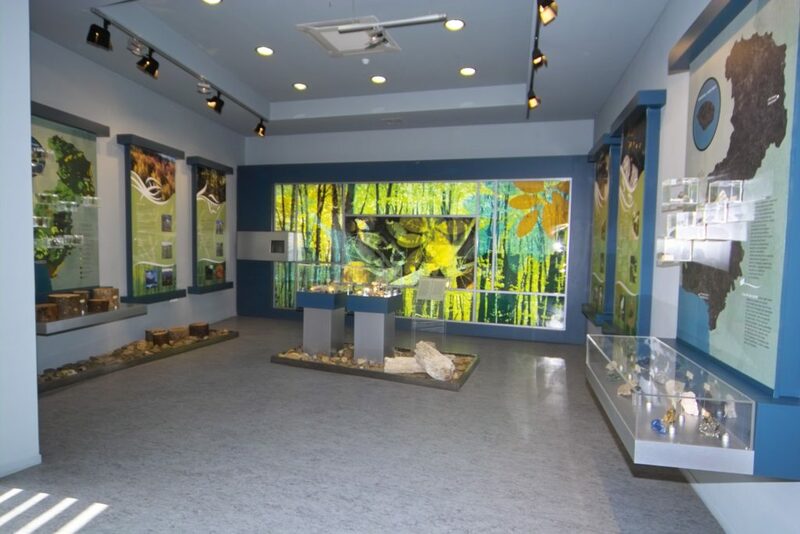 He has also the possibility to visit the Museum of Natural History, that presenting the main species of fauna and flora of the National Park of Iti. Occasionally, the monastery served several schools (pastoral, agricultural and forestry). Today the Monastery has a prey breeding ground and the Museum of Natural History. The Monastery celebrates at 6th and 15th of August. The mountain of Iti is an integral part and parcel of the massif of the mountains of Central Greece, not only geomorphological but also historical. The wild life of the mountain has a very close relation with the wild life that lives to the mountains Vardousia, Giona, Kallidromo, even Parnassus and is in direct relation with the Pindus Mountains. Iti is on the verge of Fthiotida and Phokida and the highest peak is Pirgos (2152 meters). The figure of the mountain on the north side, where the mountain ends in the valley of Spercheios river, impresses with its steep slopes and vertical cliffs which create magnificent waterfalls. The creation of the waterfalls is the result of faults and violent changes that took place in the valley over the years. The largest waterfall in Central Greece is Kremastos, a very impressice waterfall, is over Kompoti village in Stenovouni, and exceeds 100 meters height. On this side of the mountains the magnificent canyons have attracted the interest and curiosity of many climbers and they have become famous worldwide. There are impressive canyons, such as Gorgopotamos, Kakavos, Kamariotis, Rodokalos, Gerakari, which are suitable “nailed” for climbing. The predominant rock is the limestone, and that’s the reason why the area is dotted with karstic formations. Further east, near Loutra Ypatis and Mexiates, is the Fournospilia with evidence of use from the Neolithic era, even as a sacred. On Agiospilies (or Ai-Spilies) ,above the Mexiates Caves, the Grammenes Caves and the Kompotiades, frescoes are rescued, confirming that Agiospilies were used as shelters monks (hermitages) in past eras. Very close to Ypati, in the area of Xerias, there is the abyss of Anemotripa, a cave where for the past 2.500 years magic rituals were taking place. East is the canyon of the River Asopos, which is the natural boundary between Iti and Kallidromos. The crossing of the canyon, that is taking place every autumn, is the cause for nationwide meeting of mountaineers and naturalists. The wild beauty is striking, especially for the passengers of the railway and the walkers of the “railway trail”. Westwards , the limit is the ancient river Inachos (current Vistriza) that separates Iti from Vardousia. The abundant waters of the river put in motion several water mils in the previous years. Nowadays the waters are used for production of electric energy, from several small hydroelectric factories. Southwards, the landscape becomes softer and the lines smoother. The Boeotian Kifissos, natural boundary with Giona, and Mornos, natural boundary with Vardousia, define the area of the mountain with the vast forests. The half of the area around the mountain was characterized a National Park at 1966, in order to maintain biodiversity and preserve the special geological features. The figure of the wild and inaccessible mountain, which is created by looking at low, particularly in the east and north side, is replaced by another completely different picture, when we are at the heart of Iti. In the plateau Katavothra, southwest of the park, are located on the one hand, the namesake cavern, which previously had given his name to the mountain, and on the other hand the remains of the pyre, a significant ancient temple, dedicated to Hercules. In the area there is a variety of traditional faucets, as Amaliovrysi, Perdikovrysi and Kalogeros(Hoxha) and rich spring waters such as Rufias, Velouchi, Asprovrysi, Cydonia and many others. The rich flora, result of both the composition of rocks and the particular climatic conditions, gives special value to the character of the mountain, that is considered to be one of the beloved mountains for nature lovers, walkers, climbers and cyclists. The significant fauna Iti is characterized by a small number of goats, which unfortunately ruthlessly hunted by poachers, and greater numbers of various mammals and many birds. 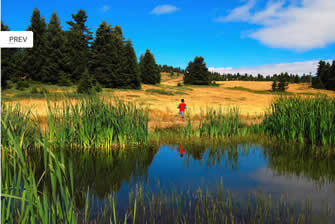 To the south lies the plateau Makrykampi, with old crossroads of mountain paths and valuable wildlife refuge. Delphi is both an archaeological site and a modern town in Greece on the south-western spur of Mount Parnassus in the valley of Phocis. 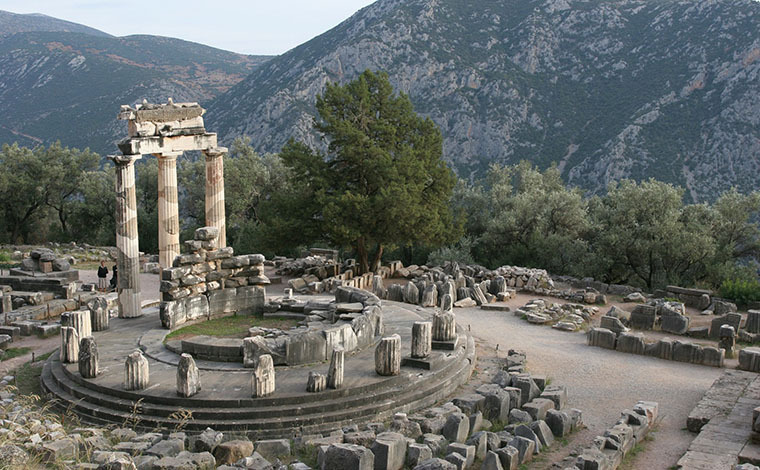 The site of Delphi was believed to be determined by Zeus when he sought to find the centre of Grandmother Earth (or Gaia). Read more….